If ever a feature had a title that just calls to me, it’s this one. I have super short hair myself and, as much as I love it, sometimes I do panic rather when an invitation for a special event arrives and I know that exciting updos and amazing transformations are beyond me. This feeling can certainly be compounded when you’re considering hair accessories for your wedding but, fear not, as today I’m going to let you in on some trade (Glitzy) secrets. 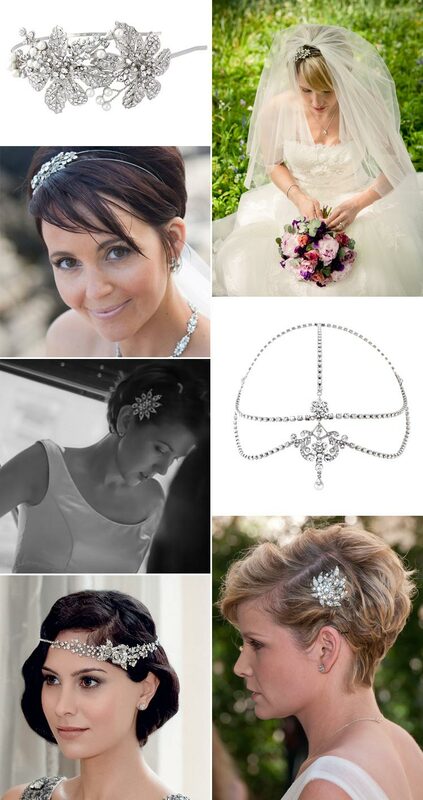 Firstly, side tiaras and headbands are absolutely made for brides with short hair. They look stunning and a piece like the Precious Leaves side tiara is fabulously extravagant with plenty of Gatsby glamour. It’s a statement piece that works so well with short hair. When you’re choosing a tiara, just make sure that you opt for a band with tension rather than a rigid band that would need pinning into your hair. If the exuberance of a large piece doesn’t attract, then definitely consider a smaller hair slide or a clip or comb. These are delicate and elegant and look amazing on a shorthaired bride who’s going for a more restrained look or making a statement elsewhere in her outfit. Do make sure you check the weight of anything you choose though so it won’t pull itself out of your hair come the big day. Hairbands can also be re-purposed for the shorthaired bride. Why not wear one across the forehead or even ‘Alice’ style? They won’t need to be nested into long hair and you could even change your look around between ceremony and reception. I just adore this Twenties Charm hair band. Another hair accessory to consider for your wedding day is definitely a chain headpiece. They look perfect on bobs and slick short styles and are easy to attach with a few Kirby grips. Whilst we’re talking about Kirby grips, a little tip from recent photoshoots is to use two grips placed in an X in a section of hair that you’ve pulled taut and then put your hair accessory over the top. This creates tension and adds a little extra security to hold the weight of your tiara or headpiece. Aside from these sparkly options, flower crowns and garlands also look excellent on short-haired brides so I hope you agree with me that however short your hair might be, you’ll never be short on options for wedding day hair accessories!